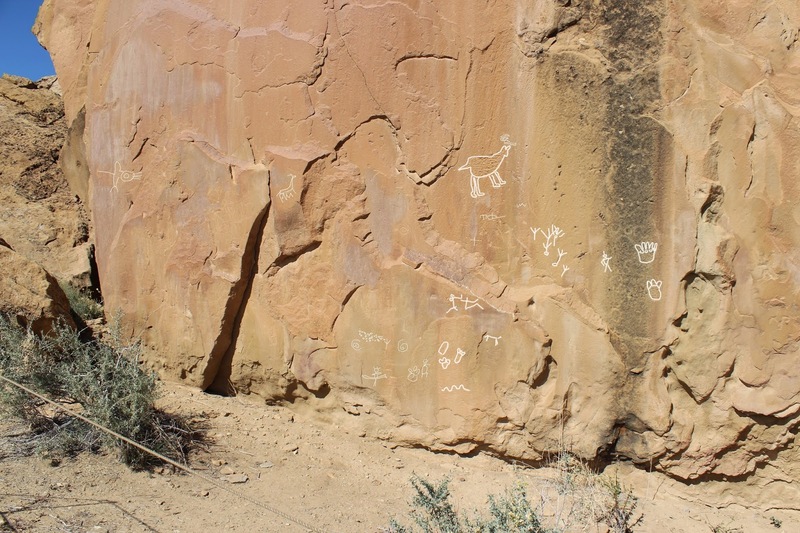 The Gallo Cliff Dwelling is located at the Gallo Campground in the Chaco Cultural National Historic Park in northwestern New Mexico. 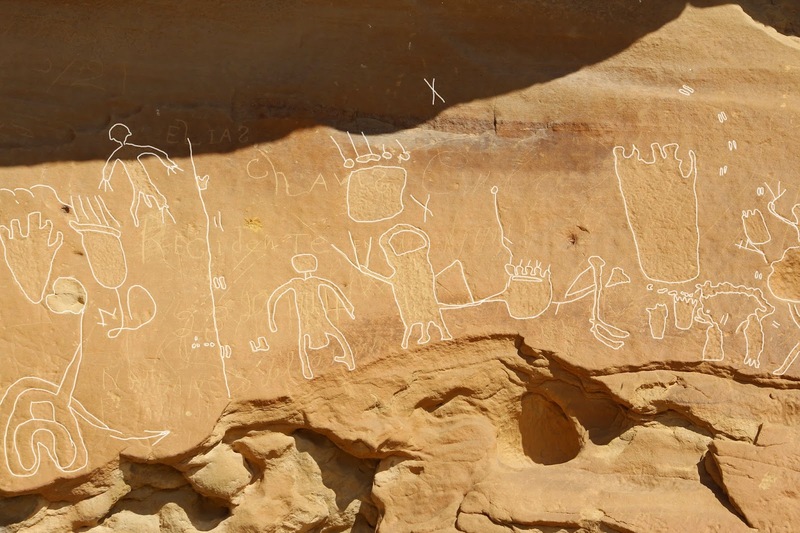 The site includes a cliff dwelling and numerous petroglyphs that date from the Chacoan occupation to the more recent Navajo times. The Gallo Cliff Dwellings were an outlier site of the Chacoan Great Houses within the park that would have been inhabited by farmers that worked the nearby fields. 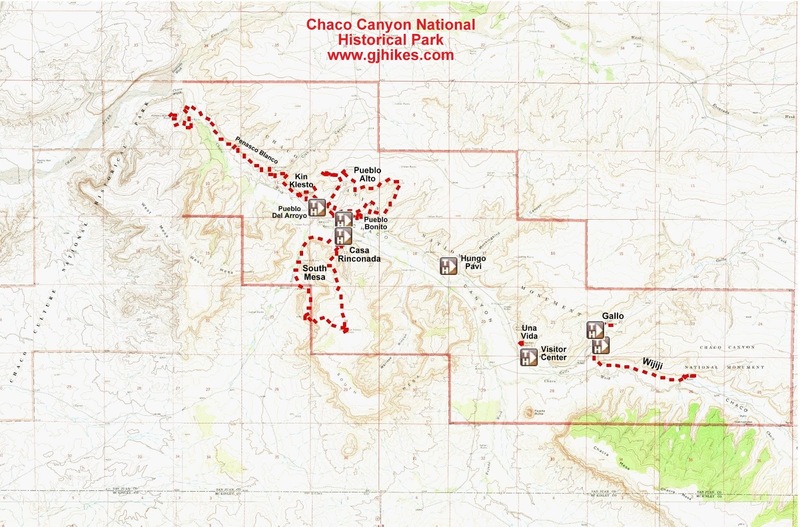 The trailhead and cliff dwelling are in the Gallo Campground just inside of the park. For those not staying in the campground the best place to park is near the restrooms where you can pick up the west end of the trail that leads around the base of the cliffs. Petroglyphs can be found on the flat surfaces of the cliffs face. For the most part they are very faint and barely discernible. We made a rough outline of a few of them on our computer. Bear paws, which may be a clan symbol, are a common image on all of the panels along the cliff. This panel has a little resemblance to the room layout of a Chacoan great house. From the first panels of petroglyphs the trail continues around the base of the cliff toward the alcove sites. The first building sits away from the cliff lacking the natural protection of an alcove. The crumbling walls of a larger structure sits nestled within a nearby alcove. Habitation of the Gallo site dates back to 1150 to 1200 AD. That would have made it contemporary to the late Chacoan Period. As you continue down the front of the cliff there are several more panels of pictographs. The images here are more distinct and easy to see. As you look across the valley floor Fajada Butte dominates the landscape. A massive earthen ramp was built on the southwest side of the butte. The ramp leads up to a unique calendar site often called the Sun Dagger that marks both the movement of the sun and the moon. Not only were the Chacoans able to monitor the solstices throughout the year but they apparently understood the major and minor lunar standstills. This picture is of another alcove site that is located north of the entrance road just outside of the park. The Gallo Cliff Dwellings make it easier to understand the overall picture of the Chacoan Period and how things changed over time. The need to move fields as the soils became depleted was a common fact of life in ancient times. During present days farmers use fertilizers and rotate crops to help insure a bountiful harvest from year to year. In ancient times they simply moved the field to a new plot of ground. It is easy to see how eventually they would have to move a greater distance to sustain themselves. The Gallo site is worth the 30 minutes it takes to check it out. If you would like to see it for yourself then all you have to do is 'Take a hike'.